Post-partum skin and a tropical vacation emerging from the dead of one of the most awful New England winters ever is a tricky mix! 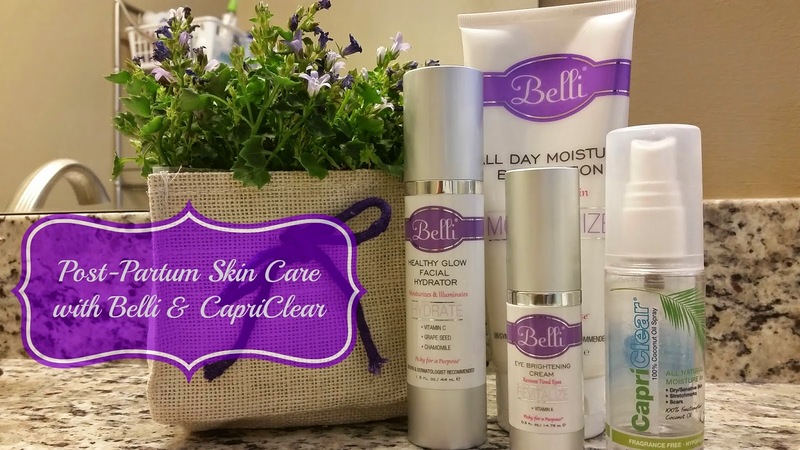 It's incredibly dry here in New Hampshire and thanks to Belli Skin Care and CapriClear Moisturizing Spray I've been using the product lines the past few weeks as I prepare my skin for warmer temperatures. My skin has lost its glow that I had during pregnancy, but I still very much feel postpartum due to hormonal adjustments I'm going through - I have a few breakouts popping up lately. Thankfully Belli has a few amazing products in their arsenal that are helping and are also gentle, free of harmful parabens, sulfates, dyes and artificial fragrances. Lately, the Revitalize Eye Brightening Cream (MSRP $39 for 0.5oz) is what I need the most as Grayson has been in a wakeful period going on nearly two months. I'm also a contact lens wearer and am especially cautious about what goes around my eye area. The cream is light going on and while my bags and circles haven't completely dissipated, it works even as a moisturizer, soothing and refreshing this delicate area. The Cosmetic ingredient Review (CIR) has fully assessed this ingredient and found it to be safe. And, it passes our teratology and LactMed screening processes which means it does not have a known link to birth defect or miscarriage and is not harmful if passed through breastmilk. The ingredient serves a couple of purposes. It is an anionic surfactant and thus lowers the surface tension of water, making the water spread more easily. It also serves as a detergent. We have two main requirements for an ingredient at Belli. 1) That it’s safe and 2) That it adds to the effectiveness of the product. We believe ammonium laureth sulfate meets those requirements. My skin is parched this winter and while regular lotion doesn't quite cut it, Belli's All Day Moisture Body Lotion (SRP $17) is a keeper! How do I know this? At the end of the day if my legs are ashy under my pants I know the lotion was too thin. The All Day Mositure Body Lotion feels rich and indeed keeps me moisturized all day. The citrus scent is stronger than the Body Wash, but I like it as the final "wake-up" step before heading out for the day. I keep it simple when I wash my face, but I am careful to moisturize daily. Part of this is sun-safe practice and part of it is because my foundation is blended into my moisturizer giving me and SPF protection. While the Healthy Glow Facial Hydrator lacks SPF, the impressive ingredient list helps me feel like I'm nourishing my skin: grapeseed oil and vitamin C. It's good stuff that's not too heavy, but feels so lush! In addition to my face and body, I hone in on the most prominent challenging area that I have postpartum: my belly. In the first few weeks of pregnancy I wrapped my belly to help the puffiness go down, but am amazed by how slowly it's taking the second time around despite me being active. My body is really holding onto extra calories for baby! Enter CapriClear Spray-On Moisturizer (SRP $19.99 for 5.2 fl oz; $10.99 for 1.9 oz ). It's 100% fractionated coconut oil meaning that it's extra pure, free of preservatives, additives, fragrances, parabens sulfates, PABA and other items. I'm stickler for a good spray bottle that mists evenly and CapriClear does so perfectly. As it's touted for stretch marks I find myself spraying all over right out of the shower as well as in my hair on wash day. I even use it before I wear my waist trainer and it helps with the tone of my tummy. You can find Belli products at your local buybuyBaby as well as online at www.BelliSkincare.com while CapriClear is available at Ulta, Harmons, Bed Bath & Beyond. What's your troublesome post-partum skin concern? I'm so glad to be getting back on track!